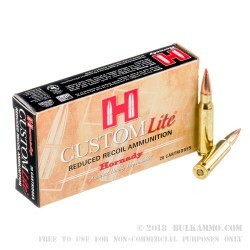 The Hornady Custom line of ammo was designed to provide shooter with choices they would not normally get from commercial ammunition sources. They have gone far past the usual cartridge offerings to give their customers more options than many other companies. 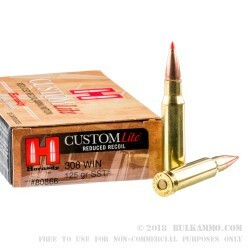 One solid example of these Custom rounds is the Hornady Custom Lite 308 with 125 grain SST or Super Shock Tip bullets. This Hornady .308 ammo was designed with the end-user in mind, primarily focusing on the reduction of recoil impulse, and the reduction of the muzzle blast. These loads are produced with a lighter weight 125 grain SST (Super Shock Tip) bullet. The bullet features the instantly recognizable Hornady red polymer tip that get pushed down into the inner lead core of the bullet, causing it to expand or ‘mushroom’. This effect is combined with the speed of the round creates a large wide wound channel. 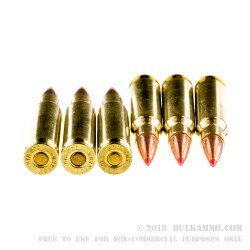 These boat tail bullets also feature the Interlock technology and a copper jacket that surrounds the bullet completely (Other than the tip of course). The bullets are loaded into Hornady’s top of the line, thick walled, high polished, reloadable brass cases with non-corrosive Boxer primers. These cartridges have a muzzle velocity of 2,675-feet per second, a heavy-hitting muzzle energy of 1,986-foot pounds, and a ballistic coefficient of .305. These come packed in small, 20 round boxes so they are easy to transport to the range to do some target shooting with the family. 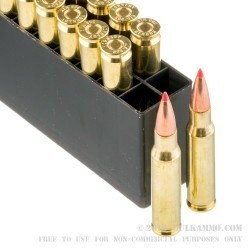 Get your boxes today and send some rounds downrange.